It seems strange to write a book about a little garden only fifty feet long and fifteen wide! But then, as a friend pleasantly remarked to me, "it extends upward," and what it lacks in area is more than compensated by the large joy that grows out of it and its uplifting and refreshment of "the Spirit of Man." Her life was filled with joys: her deep connection to the Isles of Shoals and the natural world, gardening, creativity found in writing and painting, and friendships, and difficulties: an unsatisfying marriage to her tutor ten years her senior at age 16, the birth of a son (the first of three) at age 17 who suffered from the effects of a problem birth for his entire life, a struggle for money, and care of her parents and responsibilities to the family hotel on Appledore. She died at 59. Four years before her death, she wrote to a friend: "I have given my strength all away all of my life, and now I am bankrupt." Here is a list of the books I have been reading. I recommend them all. Sandpiper: The Life & Letters of Celia Thaxter by her granddaughter Rosamond Thaxter. If you're interested in reading about Celia, I suggest you start here. Rosamond was born a year after Celia died but she learned much about her from family members as well as her own research. She frequently lets Celia speak for herelf with quotes from her letters. "It seems to me the worst of all the plagues is the slug, the snail without a shell. He is beyond description repulsive, a mass of sooty, shapeless slime, and he devours everything." "The orange of the Iceland Poppy is the most ineffable color; it 'warms the wind' indeed! I know no tint like it; it is orange dashed with carmine, most like the reddest coals of an intensely burning fire." and how she arranges them in the inn and house. "In the centre of a round table under one of the chandeliers is a flaring Venice glass as pure as a drop of dew and of a quaintly lovely shape; on the crystal water lies therein a single white Water Lily, fragrant snow and gold." 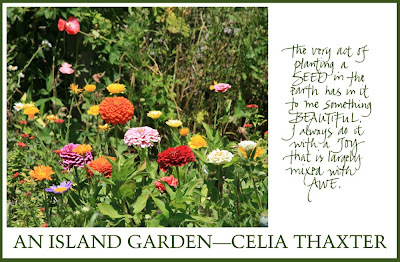 A wonderful book with essays and lots of examples of Celia's work. I love her painted china. And a wonderful website with tons of material at SeacoastNH. It's well worth a visit. what a beautiful wild dream of an island with it's very own lighthouse! I am reading a magic book at the moment about "a small snow covered island - so tiny that it can't be found on any map" called "The Vanishing Act" by Mette Jakobsen. I am in awe of the wonderful wordsmiths of our world who can write me to a place I have never been and change my life forever. Thanks Mo. I'm going to add The Vanishing Act to my reading list.